The varicella titer is a blood test that checks for immunity to the varicella-zoster virus (VZV). Also known as a chickenpox titer, this varicella test measures IgG antibody levels to show that one's immune system can protect against a varicella infection or shingles. What is a varicella titer? A varicella titer, also known as a chicken pox titer, measures the varicella IgG antibody blood level. Why is a varicella titer important? The varicella titer test is important because it checks to see if one has varicella, or chickenpox, immunity. Who gets this varicella blood test? This chickenpox blood test is frequently ordered by healthcare workers for school or work requirements. This Varicella Titer is a blood test. The varicella titer, also known as a varicella blood test, VZV blood titer, chicken pox titer, chicken pox test and varicella test, measures varicella IgG antibody blood levels to check for immunity. Varicella is caused by the varicella zoster virus (VZV), a member of the herpesvirus group, and is highly contagious. Sometimes known as chicken pox, the infection spreads through contact with the droplets of someone who already has the varicella infection. If one gets infected with VZV, symptoms will typically appear within one week if varicella immunity is not present. Our chickenpox blood test can be helpful in identifying a current or past infection. The varicella titer itself is, simply put, a blood test that checks whether someone is considered immune to the chickenpox or not. Varicella immunity comes from having varicella IgG antibodies in your blood produced by your immune system. Many people already have immunity to varicella because they received the varicella immunization series as part of their routine vaccines or because they have had a chicken pox infection in the past. If you are exposed to varicella and are immune, these varicella antibodies will fight off the varicella virus. In most cases, people who need to demonstrate immunity through a varicella titer will be studying or working in a healthcare setting. In this type of setting, there is an increased risk of being exposed to someone who has an active form of the varicella-zoster virus in their body (i.e. someone with the chickenpox). Schools and healthcare facilities are often required to make sure that anyone stepping into a healthcare setting has demonstrated immunity to varicella ahead of time through the blood test in the event of an inadvertent exposure. To get a varicella titer test near you, simply order online and get your blood drawn at a Quest location near you. 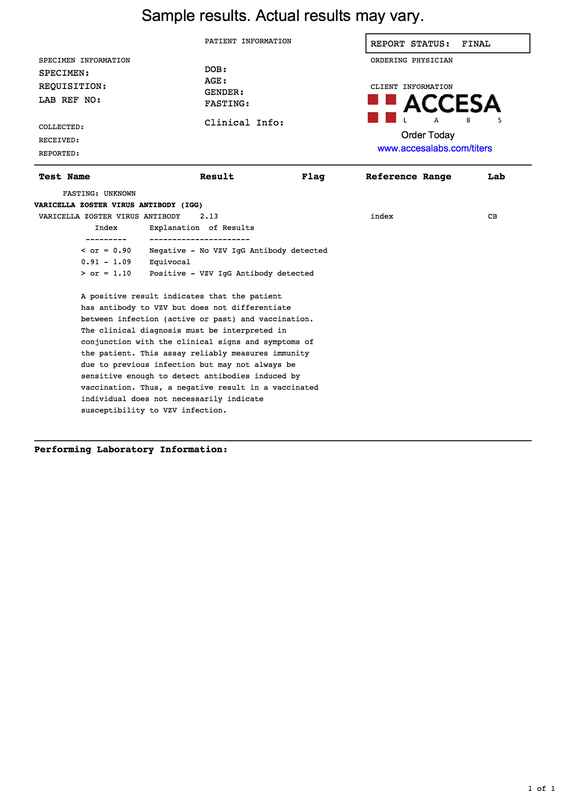 Once your varicella titer lab results are ready, they will be available for download. The varicella titer is frequently ordered with the hepatitis B titer and the MMR titer as part of the immunization titer panel. Frequently, the varicella titer is ordered with other types of specialized human titer tests or the QuantiFERON Gold TB blood test for personal or occupational requirements. The actual varicella antibody measured to check for immunity is the varicella IgG, or immunoglobulin G, antibody level. This particular varicella blood test checks the quantitative varicella IgG antibody levels which is considered the gold standard when assessing for immunity to the chicken pox. Typically, varicella IgG titer levels greater than or equal to 1.10 mean that one is considered to have varicella immunity. Interpreting one's varicella test results is not overly complicated. For example, on the varicella sample results link provided above, the varicella IgG antibody level resulted at 2.13. When compared against the ranges provided in the explanation of results below that, the result falls into the > or = 1.10 range which is Positive - VZV IgG Antibody detected. This result, in the context of general screening, can usually be interpreted as consistent with varicella immunity. If the varicella blood test results came back as < or = 0.90, that would imply a negative result which means no varicella immunity is present. In that situation, revaccination with the varicella vaccine would be recommended. Generally, an equivocal chickenpox test result (0.91 - 1.09) is interpreted as negative although it depends on who is asking for the varicella result. In this instance, most people go ahead and get revaccinated with the varicella vaccine although some people might consider redoing the test to confirm their actual varicella IgG antibody levels. Another thing to note about this particular varicella titer test is that the results are quantitative. In other words, the varicella antibody result reported is a number as opposed to just saying positive (reactive) or negative (nonreactive). Most people, schools and employers want a quantitative varicella titer when asking for proof of chickenpox immunity. There are qualitative varicella blood tests that exist out there but they are not generally recommended for most people given that the quantitative test provides more information and is not readily accessible through online ordering. Symptoms of a varicella infection range from mild to life-threatening. Initial symptoms of a varicella, or chickenpox, infection are similar to the influenza and include fatigue, headaches and fevers. After that, varicella classically produces a rash with itchy blisters that spread throughout the body. Chickenpox blisters are fluid filled and can be painful at times. Eventually, the blisters will scab over and, assuming no complications, the symptoms will resolve in one to two weeks. While most people have a fairly standard recovery, certain populations (e.g. elderly, very young, immunocompromised) can have other complications from the chickenpox. Complications like pneumonia, skin infections and meningitis can be life-threatening. While there is no cure for a varicella infection, calamine lotion is recommended for symptomatic relief and over-the-counter medications are sometimes used for reducing other symptoms like the fever. There is also a role for antiviral medications like acyclovir in certain cases to reduce the length of symptoms related to a varicella infection. The varicella vaccine is a weakened live version of the actual varicella-zoster virus. The varicella vaccine is given as part of routine vaccine schedules in the US and is thought to reduce the symptoms and complications from a chickenpox infection by as much as 90 percent. The vaccine gives the recipient a very mild form of the chickenpox (usually without symptoms) and this serves as a way to expose the immune system to the infection. From this mild vaccine-induced illness, the immune system can develop and store a memory of the varicella-zoster virus and, if exposed in the future, can mount a powerful antibody response to protect the body. While chickenpox infections have decreased in the United States, likely due to routine vaccination, there are still large numbers of cases worldwide. In 2015, 6,400 deaths occurred from the chickenpox. We hope you found this chickenpox lab test report review helpful. Varicella Titer at Guaranteed Prices.